The first four volumes of the printed Mennonite encyclopedia contain articles on specific types of periodicals, e.g. "Almanacs," and specific periodicals, e.g. "Christlicher Bundesbote," but no general article on "Periodicals." These four volumes included approximately 200 entries on periodicals. Mennonite bibliography, 1631-1961 (published in 1977), lists slightly more than 830 periodicals. This does not include publications of very limited audience. A complete count of Mennonite periodicals in 1988 would probably total more than 3,000, some ephemeral, others passing the century mark in duration of publication. The earliest known Mennonite periodical is Naamlijst der Tegewoordige in Dienst Zijnde Predikanten der Mennoniten in de Vereenigde Nederlanden, published irregularly under variant titles, 1731-1829. The title with longest continuous publication seems to be the annual Kalender für der Versammlungen der Mennoniten-Gemeinden in Ontario (1836-). Still published by the Old Order Mennonites of Ontario, it was launched by the Mennonites in Ontario to provide the schedule and location of worship services. The 20th century has seen an ever-increasing expansion in the number of Mennonite journals, differing widely in content, intended audience, level of scholarship, frequency of publication, and length of life. The shift from letterpress and other more cumbersome methods of printing to printing from photomechanical plates and masters has stimulated professional and amateur printing alike. This has been accompanied by a tendency in major Mennonite organs, both in Europe and North America, to a more journalistic style, briefer articles, more informal institutional news, more illustrations, and less personalia, except for formalized birth, marriage, and death notices. 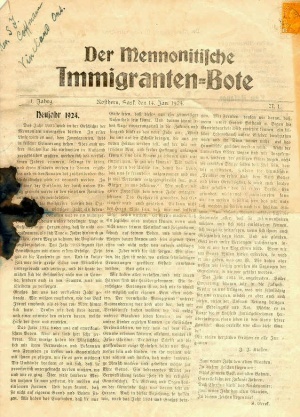 For younger Mennonite churches outside Europe and North America for and by whom there had been very little literature produced, the newer methods of printing have facilitated production of journals. The older major denominational and a few inter-Mennonite journals, including scholarly journals, now compete with a burgeoning flood of periodical literature from departments and committees of an increasing number of church institutions, minority and special interest groups, local congregations, regional historical societies and family genealogists. Unfortunately, the obscurity and complex nature of this body of literature so important to researchers is such that there is little hope of exhaustive listing or preservation except or even through combined efforts of Mennonite historical libraries. Springer, Nelson P. "Periodicals." Global Anabaptist Mennonite Encyclopedia Online. 1989. Web. 24 Apr 2019. http://gameo.org/index.php?title=Periodicals&oldid=143368. Springer, Nelson P. (1989). Periodicals. Global Anabaptist Mennonite Encyclopedia Online. Retrieved 24 April 2019, from http://gameo.org/index.php?title=Periodicals&oldid=143368. Adapted by permission of Herald Press, Harrisonburg, Virginia, from Mennonite Encyclopedia, Vol. 5, pp. 691-692. All rights reserved.